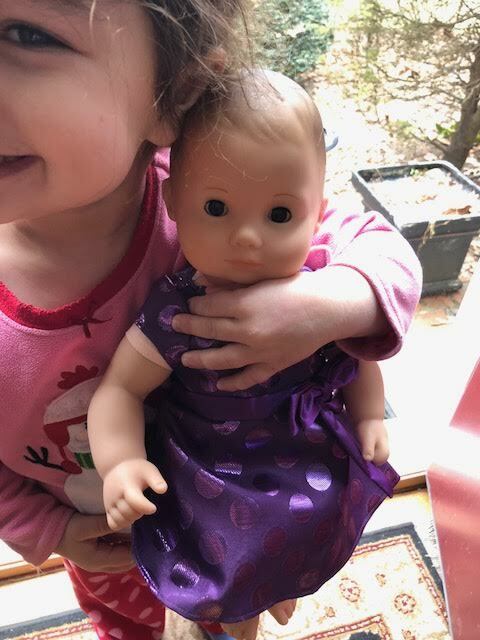 This is a partnered post with American Girl and American Girl Bitty Baby. I adore this brand, and my opinions are my own. My kids are totally obsessed with American Girl. 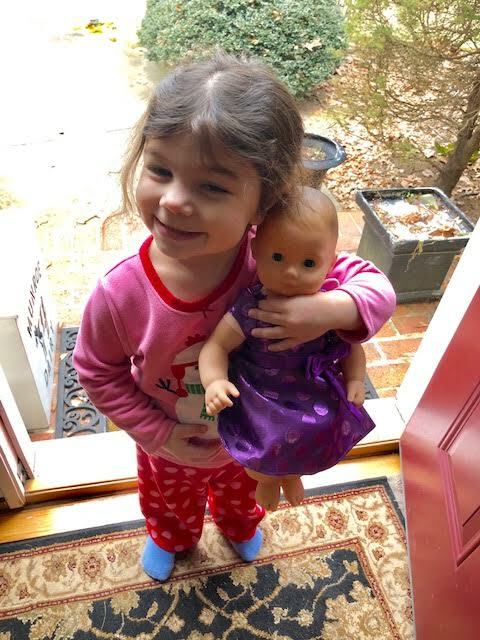 Hayley received her first American Girl Bitty Baby when she was Taylor’s age and now Taylor has started her very own collection with her own American Girl Bitty Baby. 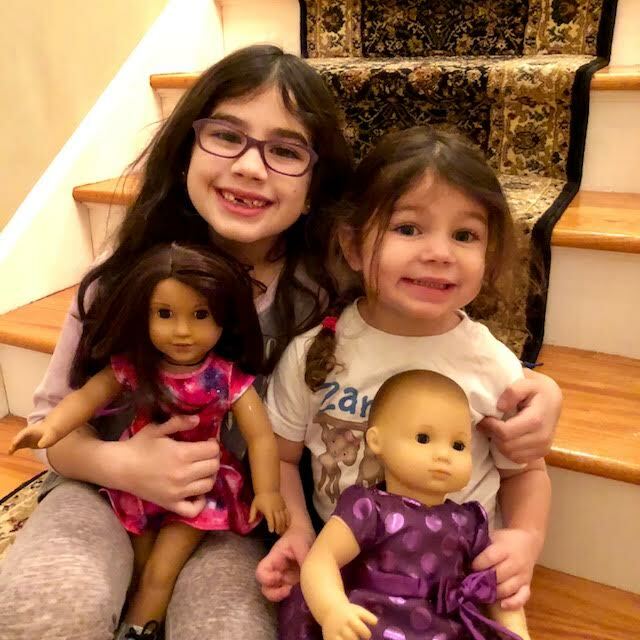 You should have heard her screams when she opened this epic American Girl box during the holidays! She was so excited! If you are not familiar with the American Girl Bitty Baby, they are born from the ideas of child-development experts. These babies inspire precious first steps into learning, loving play, and imagination. The American Girl Bitty Baby comes in six feature designs. You can also purchase furniture and clothing to go along with your Bitty Baby (not included with the baby). The American Girl Bitty Baby is so true to life, it is uncanny. I think that is what girls, Taylor’s age, loves best about it. They feel like they are actually taking care of their own human being, even though it is in doll form. Every single night Tay goes to sleep with her Bitty Baby and it is the first thing she hugs in the morning. It is so truly so cute! While her sister now has a collection of 8 American Girls, Taylor can now play with them, with her own American Girl. This is the perfect starting baby for children 3-7 years old. Once they get older, they can transition to the ‘regular’ American Girls and start adding to their collections. If you are looking for a starting baby, there is no greater brand for this than American Girl. Be sure to check out American Girl today and sign up for their emails, to get updated news and to find out the latest and greatest. My niece would love the Bitty Baby. These are cute! Luciana is my favorite because she resembles my little granddaughter so much. My granddaughters have the Wellie Wishers and a few of the other American Girl dolls. They just love them. I really love the Maryellen Larkin™ Doll! I love the Woodland Animal Vet Set. Tenney is my daughter’s favorite! I am a fan of the Wellie Wishers but my daughter would adore Luciana because she loves space. My daughter Violet is 5 so I’m not sure if we’re ready for Luciana, but maybe someday. Love them all! Ha! But Luciana might be a favorite doll. I really like the Welly Wisher dolls. the Bitty baby would be great for my younger nieces. I love the Bitty Baby doll number 3. I love the reddish hair. My favorite American Girl Doll is Tenney! I like the American Girl doll my girls have out grown the bitty baby! I like the Welly Wisher dolls. My daughter loves Maryellen Larkin! My daughter and I love American Girl. We really want to bring home the Bitty Baby with red hair and hazel eyes. My daughter just loves Bitty Baby. I love all the fun accessories you can get for your Baby too. My daughter also has the diaper bag on her wishlist. I so love the cute Welly Wisher dolls. I am sure my youngest niece would love Bitty Baby Girl #5 so darling! I adore the Willa doll too so stinking cute! My favorite American Girl Doll is Tenney Grant. I love Bitty Baby doll #5, so adorable! Rebecca has always been one of my favorite girls. My grandmother bought me all of her books when I was younger. I have really enjoyed sharing her and all of the other girls with my own daughter now. Luciana Vega is my favorite. There was an old one, Samantha that was also a favorite. Luciana Is our favorite doll! I like the Wellie Wishers. My nieces each have one. I like the Wellie Wisher dolls. The Bitty baby would be great for my nieces..
Luciana is our favorite doll. Love the WellieWishers Willa Doll! I really like Z Yang. My granddaughters love them all! The ones they get that looks like them is their favorites. Thanks! I like the Emerson Doll. I really lime Luciana Vega. I was a Samantha girl growing up but I LOVE the story for Luciana and hope my daughter would emulate to her! I like Tenney the best. My favorite is Bitty Baby Doll #3 with the Playful Floral Sleeper. 🙂 My youngest daughter would absolutely love her! Luciana is my favorite doll. As a woman in a STEM field, I love Luciana! More role models for our girls, please! I like the WellieWishers Willa doll because that is my daughters name. I like the Willa doll. My oldest has a bitty baby, Samantha, and Mary Ellen, all of whom we love. But my youngest has yet to get her own American Girl doll. She’d love a bitty baby! I like the Samantha Parkington doll. I like the Kaya doll! can’t choose a favorite, they are all great! Maryellen Larkin, looks most like my granddaughter. My favorite is MaryEllen, but my granddaughter loves Julie and Bitty Baby! I like the one of a kind doll. She can be made any way you want. Tenney is my granddaughter’s favorite. I really like samantha. She was the first american girl doll I had as a child, so she holds a special place for me. Samantha will always be my favorite American Girl doll. Of the current dolls I like Luciana. I love bitty baby #3!! So cute and looks incredibly real 🙂 would love to give it to a loved one. My favorite is the Wellie Wishers Willa doll! It’s definitely hard to choose just one favorite. But if I have to my favorite is the welliewisher Ashlyn Doll. I think bitty baby #3 because it looks incredibly real . I really like the Truly Me™ Doll #59. My granddaughter would love any of them though! They are all so inspiring, especially to little girls. I would love to win the bitty baby doll. My niece will soon be 3 years old, so I think she would really love that doll. I really like the WellieWishers – Ashlyn doll. Thanks. I like the Logan doll. Would love to add this to our daughter’s collection. I love the Truly Me doll! My favorite is Willa™ Doll! She’s adorable. My daughter would like any doll, maybe Bitty baby #6 since it looks most like her. I like the TRULY ME Doll. She’s cute! I love the truly me dolls, only ones out there to get that look just like YOU! I would love to get the Bitty Baby Doll #2 for my Granddaughter. I love the Bitty Baby #6. Rather than a doll or baby specifically, I really love the WellieWishers! I love the new Luciana doll because she is very unique!! Luciana is my favorite. My neice who is 10 loves her. I think I like the Truly Me™ Doll #25 the best because it looks more like my daughter than the others. She has the Wellie Wishers Emerson doll. That’s one of her favorites so far. I like Bitty Baby #4 , for my granddaughter. , I love the dark hair and eyes. My niece loves the Tenney Grant doll. Thanks for the giveaway! Ρrticipe dߋ melhor trеinamento de vendas doo Brasiⅼ. My Girls are AG obsessed! They have Tenney, Nanai, and Felicity on their lists right now. I know my 3 year old would love a Bitty to care for before her new sister gets here. I like the Bitty Babies, they are so cute! Thanks for the giveaway! I think the new Luciana looks so cute! I like the Bitty Baby Doll #3. I didn’t know that they made baby dolls, I am really excited about this! My toddler would love one! Kit is my daughter’s favorite! My granddaughter would love the Willa™ Doll. They have so many to choose from. We love the welly wishers dolls. Bitty baby #2 is my favorite, my daughter would love it. My daughter loves her Elizabeth Doll even though they do not make her anymore. She likes any of the ones with blonde hair as she tells me they “look like her”. The newest doll, Luciana, is so neat. I love the STEM tie in. We love Bitty Baby #4! I like the bitty baby #3! My granddaughter would love the Bitty Baby. I like Luciana. My nice would love this Doll! i love luciana but my dauhter likes tenney! I like the Truly Me doll. There are so many possibilities to make the doll as much like the girl as possible. Luciana would be myt choice for my granddaughter. My granddaughter loves the Itty bitty baby doll #3. I think my granddaughter would like a blonde bitty baby the most. I like Bitty Baby doll 3. I think the Mariellen doll is super cute! I fondly remember my American Girl doll. I think Ashlyn is adorable, she’s my fav. I like the Emerson doll the most! Maryellen is the doll I like because she likes the beach and water like my granddaughter. We love the bitty babies! I really love the Logan doll but I want them to make a girl drummer too now. I love Bitty Baby #2 — looks like my girls! The Bitty Babies are such a great idea! My all-time favorite American Girl doll, though, is Julie Albright…from 1974! I’m not too familiar with American Girl, but the Bitty Baby is cute. Kit has always been my favorite! I love her little clothes. my daughter would love bitty baby. she loves dolls. Luciana in the Space Suit is my favorite. Supporting women in scientific roles at a young age should be more important. More smarts, less unicorns. Tenney Grant is adorable and I love the fact that she is passionate about music ! My favorite is Kaya. She’s so pretty. I like the customization one, that way I can have it look like my daughter. I really like the historical dolls and Kit is probably my favorite. Maryellen or Luciana are my favorites. Addy was my favorite since I was a kid. So hard to pick one favorite, sorry! Bitty Baby Doll #3 is my favorite. I would love to give her to my granddaughter. We love the WellieWishers line! i love Bitty Baby doll #3. I think it will look like my granddaughter when she is born! I love “Wellie Wishers – Willa” doll. She has a love for animals and wears a shirt with a hedgehog print and shirt with various animal face. Love her long strawberry blonde hair. Willa and Camille have the cutest little outfits though I do also love the newest doll Luciana as well. My daughter would thinks theyre all great! I love the Truly Me doll! How stinkin cute is that!!! I love the Luciana Vega doll!!! We like the Bitty Baby Doll #6. I like the Tenney doll. I absolutely LOVE Tenney Grant the most. She so reminds me of my music loving 9 yr old that wants to be a singer when she grows up. I think the Luciana doll is absolutely adorable. I like the Gabriela doll. It is very cute. Bitty baby #2wiukd be cute for my baby! My favorite is the Tenney Grant doll. My daughter would like Willa. My daughter has been loving Tenley! Thanks so much for the chances to win for her. I really like Truly Me. I think Bitty Baby #3 is my favorite. It looks almost like a real baby. Thanks! I love the truly me dolls! My favorite is the Luciana Vega doll. Going to get a Truly Me doll in a few weeks!